FBI agents are devoting substantial resources to a multistate hunt for two baby piglets that the bureau believes are named Lucy and Ethel. 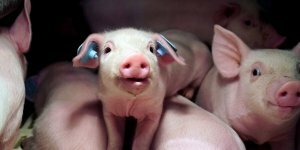 The two piglets were removed over the summer from the Circle Four Farm in Utah by animal rights activists who had entered the Smithfield Foods-owned factory farm to film the brutal, torturous conditions in which the pigs are bred in order to be slaughtered. While filming the conditions at the Smithfield facility, activists saw the two ailing baby piglets laying on the ground, visibly ill and near death, surrounded by the rotting corpses of dead piglets. “One was swollen and barely able to stand; the other had been trampled and was covered in blood,” said Wayne Hsiung of Direct Action Everywhere (DxE), which filmed the facility and performed the rescue. Due to various illnesses, he said, the piglets were unable to eat or digest food and were thus a fraction of the normal weight for piglets their age. Rather than leave the two piglets at Circle Four Farm to wait for an imminent and painful death, the DxE activists decided to rescue them. They carried them out of the pens where they had been suffering and took them to an animal sanctuary to be treated and nursed back to health.